Discover something new at the luxurious Des Menhirs campsite. 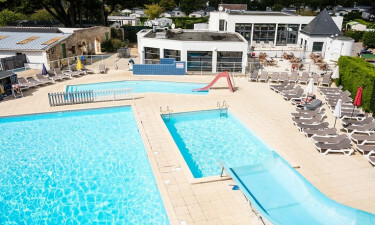 With some of Brittany’s finest beaches only 300m away, the luxury camping site of Des Menhirs in the seaside resort of Carnac Plage is an idyllic haven of fun and relaxation. Why stay at Des Menhirs? A water complex so vast, it may be visible from space! The water complex consists of a heated outdoor swimming pool with paddling pool and 2 enormous water slides. There is also an indoor heated swimming pool and toddler’s pool. The spacious terrace has thatched parasols and sun-loungers for relaxing under the sun. No luxury camping experience is complete without a little pampering. Adults can unwind in the sauna, solarium and whirlpool baths. As an additional treat there are free massages in high summer! The multi-sports ground is the place to go for tennis, boules, volleyball, football and badminton. For a more intense workout, visit the indoor fitness area, where you’ll find weight training equipment. The children’s park is equipped with swings and climbing frames, whilst toddlers have their own games room with foam modules. A team of professional animators is on hand over the summer months. At the kids club, children strike up new friendships and organise mini-shows. Kids will also love the pony club, where they can go for rides and have riding lessons. Carnac-Plage has 5 sandy beaches, sheltered by picturesque 19th century villas and pine trees. The Grande Plage is perfect for families, Légenèse and Ty Bihan beaches are more intimate and St-Colomban is the spot for water sports. 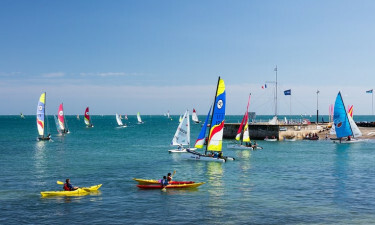 Try your hand at kitesurfing, windsurfing, canoeing, paddle boarding and dinghy sailing. Lessons and equipment hire are available from certified schools in Carnac. Carnac is world famous for its Mégalithes, rows of ancient standing stones that date back to 4000BC. Be sure to visit the fascinating Museum of Prehistory. The Parc de Branféré has a magnificent château, a botanical garden and bird park. Children will love La Ferme du Monde, a wooded area with 400 animals and a kid’s farm with petting. Hire bicycles in Carnac and head to the pretty town of Auray. Soak up the aromas, colours and sounds of its famous markets for an authentic taste of Breton life. Carnac’s night markets in July and August offer artisan stalls, live music and entertainment. 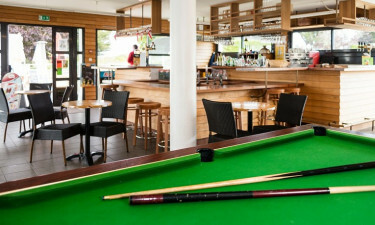 There is a takeaway and bar on-site and a wide choice of restaurants and bars in town. The mini-market stocks essential holiday items, including fresh bread.